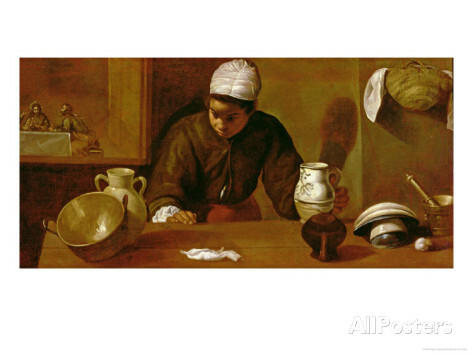 “The Servant Girl at Emmaus” by Diego Velazquez hangs on my wall, a print, an icon of my ministry, as one who has almost always felt that my ministry and life was not one of center stage, but in the surrounding support systems. The culture of celebrity ministry exacerbated that feeling when I was active in church and seminary, but this season I am even farther out on the edge in my retirement and in my recovery from surgery–limited by energy, strength and position. However, The Servant Girl is here to remind me that even in a place of limitation, I can encounter the Holy One. 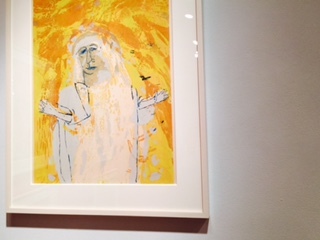 Up in the left corner on the painting I can see Jesus and his two companions to Emmaus. They have been walking the road together, wrestling and wondering, and now sit down to eat together. She, however, is the one who recognizes first that this is the Risen Christ, the Beloved One; it is evident in her attentive pose, her listening ear, her momentary pause from her tasks. So I can take heart. Even though my appointed rounds are more circumscribed than they used to be, I can still encounter the presence of the sacred, the incarnation of the holy in the encounters I do have. This week there has been an encounter with someone at an occasion where I was a stranger where I met another stranger who longed for connection, and in those moments we were joy and peace for one another. Although I cannot and do not want to enter the shrill and divisive political fray, earlier in the week I was able to sit with a wounded one to imagine together how we could be faithful citizens, yet still do the things that makes for peace, within us and for those around us. Although I can’t go far afield for long times, I can, with memory and social media, keep prayerful watch over the weeping ones, the sick ones, the fearful ones, the weary ones, the suffering ones, and those in despair, knowing that the Loving One is the healer, the Comforter, the Sustainer, of me and of the ones I hold to the Light. The Servant Girl also teaches me that my connection the holy happens when I am doing the things I have been given to do. Even in my limitation I still have laundry to fold, bills to pay, errands to run, phone calls to make, appointments to keep. When I am paying attention those are venues, however surprising, in which I might hear a word, see a sign, sense a direction from the Holy One. My daily practices may need to be adapted to my present body and mind realities, but I never go anywhere in which I am outside of the circle of God’s loving care, for me and for others. The changing world, the changing Church, the changing ecosphere, the changing social milieux all cry out for powerful activists, agents of change, makers of peace, visionaries and workers for the healing of the world. But, that is not is not the call to me right now. I think of Milton’s conclusion in his poem, “On His Blindness,” They also serve who only stand and wait. Neither is that my call. I am, like my beloved Servant Girl, asked to do daily that which is given to me, all the while paying attention to the places and ways in which the Holy One may appear, listening for the Spirit voice that says, “Go here–to the right or to the left.” Even on the margin. Some periods of my living seem quite straightforward and almost orderly, one thing after another in sequence. Then there are the other times in which I am listening to a myriad of melodies, never quiet sure where the downbeat and back beat should be. I begin a day quite sure that I know what its schedules is, and then in an instant, the phone rings or the doorbell chimes or a text message appears, and everything is suddenly rearranged. There also is the matter of density–some periods are blissfully leisurely, some others packed to rafters with deadlines piled atop one another, everything due within the same week. How did that happen? And how does the Holy One appear to me in such changing tempos? Something in this picture I took of the concert arena at Disney Hall, awaiting the performance of Tan Dunn’s “Water Passion,” gives me some clues. All the necessary elements are ready: instruments, chairs, lights and what appears to be the infrastructure for the performance. They are diverse. Some do not seem to fit the usual categories of musical offerings. Some are part of the visual architecture of the hall itself. But at the right time the music begins at the direction of the conductor. The musicians–singers, players, and movers–all follow the lead of the one who is interpreting the work of the composer, in his rhythm, at his speed, on his cue. Measure after measure unfolds, and it becomes the musical offering it was meant to be. I do not believe in a puppeteer God, who is managing the strings of my life from far above in the sky. I do believe in a Holy One who knows the set-up of my life–body, psyche, intentions, resources and limitations, the things that I keep in place continually through spiritual practice alone and with the community. I also believe that as Jeremiah the prophet says the plans that the Holy One has are for good–mine and the world around me. So my question must turn from “how did this happen?” to “how is God here?” and “what is the invitation to me when my careful Plan A unravels into Plans B, C and D?” How do I hear the downbeat for the beginning of this magnum opus of a moment? In the days I have been musing on this, I come back again and again to the way I start each day, or phase, or month, or year, or decade, when I pause to look at what is before me–the instruments, the risers, the percussion instruments, the water, the lights– to see if I have supplied them, made them ready. Then it is time to listen; I offer the prayer, “Loving God, here I am.” And I wait. Until I sense that the Conductor is starting the downbeat. Now it is time for moving in these 10 minutes, in this hour, in this day, in this time of my life. Each day has its own rhythm, and each day has its own interruptions. I am comforted by Rumi who enjoins me to welcome the uninvited visitor, even if my “plans” are thrown off. And what about those spaces where there is suddenly nothing scheduled? nothing happening? I have found that these are gifts as well–they are spaces for noticing what is around me–what is blooming, what is growing, what is shining, what is singing. They are opportunities for imagining and dreaming of what might be and where my heart longs to soar. They are fallow times when I take in the beauty, the goodness, the richness of the Word–written or sketched or embodied–all nourishing the resources of my body and soul in preparation for the next downbeat of the Conductor. This week we enter into Lent, and I will be attending to an external prompt for the rhythm of my life. 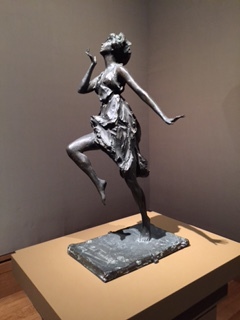 Yet within each day and its infinite variety, I will still be listening each morning for today’s downbeat and tempo, trying to be a faithful dancer on the journey of following the Holy. My friend Wendy has a blog called Bookgirl; I think i must be her twin from another mother because one of the major streams of that which gives me Life is reading. I am a book girl too! I learned to read when I was four years old, and have never stopped. Lately, however, I am musing on how my reading has and does shape my journey of Spirit, and whether or not the things I read are taking me deeper and farther in that journey. A few days ago I received a longed for order of books from my regular on-line purveyor of books of all kinds, and as I opened one which I had ordered, my body sank into a place of comfort and joy. “This, this is where my soul will be fed,” I felt as I dived in head first. I was at home immediately, and began to be satisfied with nourishing comestibles, as if I had been starved for a long time. I know that my love for books, for reading, has been a life-line for my spirit, as well as my mind. I have been filled by poetry, by novels, by memoirs, by theological tomes, by op-ed articles, even by blogs. I have notebooks full of quotation and favorite lines, some of which I have been able to commit to memory. I dive for the Book Section of the Sunday newspapers as soon as they appear. I love to engage in dialogue about a book that I am reading at the same time as a soul friend. However, recently I have found after reading some of the latest and greatest on the top sellers list, or even topping off a “must-read” from a friend, that my mouth is full of ashes, rather than good tastes, that my soul is more anxious than satisfied, and that I am still empty, rather than full of hope or challenge. I am not always sure what prompts me to pick up a book. Possibly it has become in some instances a way of staving off anxiety or delaying an unpleasant task; could I be trying to keep up with the Literary Joneses? At this stage of my life, the last half or third, do I want to invest in that which fills for a moment but does not satisfy? does it bring me Life? does it deepen my understanding of the Holy One and of the chaotic world in which we live? is there a window to the world that needs opening in my soul that this reading can provide for me? does it buoy me with its beauty? does it challenge me to take what I read and use it energetically in the healing of creation and its creatures? is this the right season for my reading this book, or does it reflect an age and stage that I have passed already or one that lies far ahead of me? Spirit, direct my eyes, my mind and me heart! 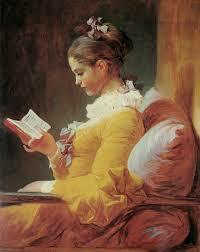 The painting is “Young Girl Reading” by Jean-Honore Fragonard, located in the National Gallery of Art, Washington D.C. I recently found the first sermon I ever preached to a congregation, over 30 years ago. It was called “Freed to be Free,” based on Galatians 5, and I preached it on a summer Sunday when all the regular church staff was away. I was in seminary, had had no preaching classes, just trying to imitate what I had always heard from the pulpit. I am not sure why I was preaching on that text, because I didn’t know much about the lectionary at that stage of my learning. But as I re-read it, I could see clearly that the call to freedom in my spiritual journey was compelling and urgent for me. And the call to a journey of freedom in the Spirit still compels and invites me. I began to wonder how I have lived into the FREEDOM that is called me so deeply when I first preached on it. I see how careful I was, coming from whence I came, being sure not to allow for uncontrolled license, or to confuse FREEDOM with “doing what comes naturally.” I felt is necessary to speak a cautionary word about anger and self-centeredness, but I was not able to anticipate the ways in which I would become free on my journey of Spirit. This past month, I have found myself unable to write anything. And maybe that was the FREEDOM I needed–no self-imposed deadlines, no internal pressure to find meaning or something meaningful, no meeting my own carefully crafted intentions. Maybe I needed to listen to the Word that came to me when I was on retreat, which was to “Just stop!” I am at a delicious location in life, where in most ways, I can do just that–stop, let it all go for awhile. And so I have. This July I have completed no projects, no ambitions, not even many lists of to-dos. I am free to remember and marinate in, maybe even to trust, that there is nothing that can separate me from the Love of God. I am free to love and appreciate my person that God created–body, mind and spirit. I am free without fear to allow the Spirit to gentle and guide me through whatever means She chooses: sources from my own tradition, those of other traditions, using words or no words. I am free to love those that are brought to me whether or not we seem to have things in common or whether we agree on anything. I am free to let go of judgement of another person’s motives and behaviors, while holding one to my own beliefs and convictions. I am free to speak and act for justice and mercy for those who have no voice or agency or protection. I am free to bring my gifts and talents to the communities in which I dwell, and free to say “no” when the call does not have my name on it. I am free to enter into the deep waters of forgiveness–offering it, asking for it, receiving it–and then “letting it go.” This is applies even when musing on my own failures and shortcomings. I am free to give thanks for the abundances of my life–people who have loved and are still loving me, places I have dwelt where I experienced Holy Presence, moments of “kairos” time, where I with others recognized that surely God was in that place. I am free to continue to be a growing up, all the days I am given to live, not ever needing to call a halt to the practices of Spirit that deepen my understanding of the Holy and how I am called to live and move in the moment. My understanding of God’s freedom for and in me keeps growing…I keep being set free; I am banking of the words of Jesus from the book of John: If the Son makes you free, you will be free indeed. May it be so! It’s always important to know where you are going…if possible! 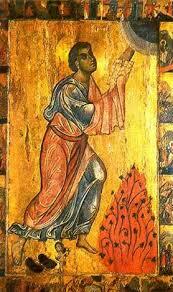 But Thomas, the friend of Jesus, poses my question: “Lord, we do not know where you are going. How can we know the way?” (Jn.14:5). I am one who is on the journey, but often I am confused or just in the dark about a way forward. Jesus refers his closest friends back to their journey with him already: “I am the way,” he says. It became a cliche several years back to ask one’s self “What would Jesus do?” But, in many ways we know how to go forward because we have already learned what is important. Jesus taught love, forgiveness, inclusiveness, kindness and compassion. None of those steps or actions can be the wrong steps, no matter where we find ourselves. And he also promised that his close friends would experience the Spirit living within them, reminding them of the ways of love. In celebrating my retirement, my beloved friend Sandy preached a whiz-bang sermon, in which she likened the Holy Spirit to a spiritual GPS in our travels, giving us course correction, reminding us to back up and turn around, telling when we have taken a wrong route. I have experienced that GPS within me, making itself known in sacred reading, in quiet prayer, in conversation with others. It is a source of creative energy, a fountain which produces ideas that seem to come from nowhere, about how to love, when to be quiet, and ways to think outside the box about knotty problems. That Spirit also sharpens my senses to signs along the way that I might not be aware of otherwise. 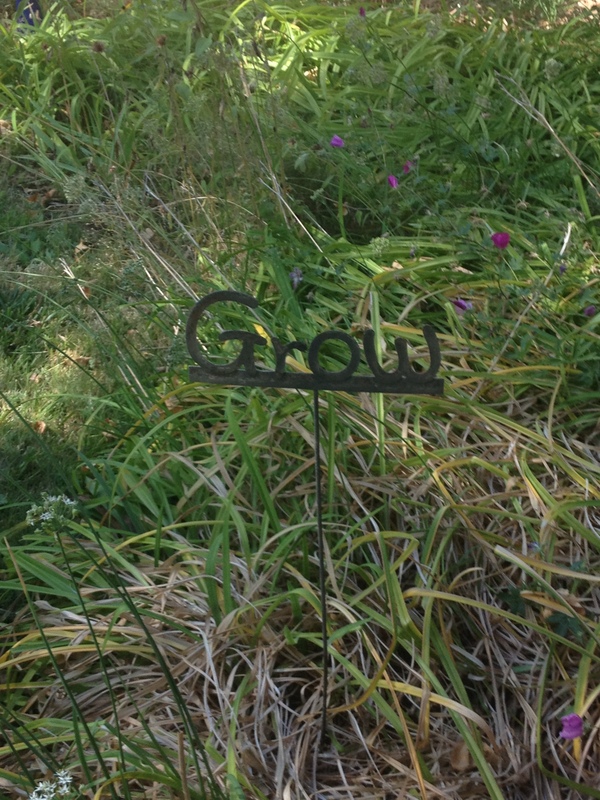 While I traveled last fall in northern New Mexico, I came out of my room one morning to see the sign on the grass in front of my room. It invited me to GROW! There were no further instructions at that site, but I was challenged to muse on ways I can still grow. I see that I can still learn to strengthen my body so that I can walk and hike to places I never imagined. I have set myself reading that is beyond my comfort zone, so that my intellect is still gathering and processing points of view that I have never considered. Social media has allowed me to converse with and pray with and for people whom I have not met, but whose view from their location opens me to a wider caring and commitment to the healing of the world that God loves. Signs abound in my life with the Spirit lens with which to view them, and they lead me onward. How could I have known that installing a drought resistant garden in the front yard would bring me a more joyful appreciation of the varieties of creation and prompt me to a deeper commitment to the care of that creation and its resources? I used to wait for a sign, she said, before I did anything. Then one night I had a dream & an angel in black tights came to me & said, you can start any time now, & then I asked is this a sign? & the angel started laughing & I woke up. Now, I think the whole world is filled with signs, but if there’s no laughter, I know they’re not for me…. Thanks be to God for the Spirit who shows us the sign, and fills us with laughter as we go!